Mary never met her biological father, a dashing soldier from the 308th Squadron, but his name was on her birth certificate. What she did know was that he at one time was in Tennessee, which is where the 20th Ferrying Group was stationed. She knew his name, his military occupation and not much more. But it didn’t take much research time to identify the soldier her mother claimed was her father. The name was correct, the occupation was correct and the location of his troop. A few phone calls, public record searches and genealogical searches gave us information on his siblings, daughters and wives, plus several of his nieces and nephews. So what’s next? Mary believed and hoped that this 60 year search would lead her to her biological family. Like all clients of “Non-Paternal Events” (NPE), to include all cases where biological kinship needs to be proven (i.e. adoptions, unknown parentage), DNA testing was offered to the known biological daughters of the soldier. The daughters refused stating “We have no interest in meeting anyone who claims relationship with our family, nor will we participate in a DNA test (we know it will come up negative).” Really? In about 40% of these cases, further research is denied by the biological family. Surely, Daddy didn’t have a child out of wedlock! (And in this case, it was before he ever married Mommy, but surely Daddy was pure)! In spite of the harsh threatening words that followed in the email, if kinship exists, it can be proven even without consent of the daughters. How? Still through DNA. It only will take, one grandchild, nephew, niece, great-nieces/nephews, or any cousin (up to 5 generations) of the biological family to prove kinship. That’s a lot of folks that can possibly take a DNA tests and the likelihood is great that someone will. So my advice to Mary and those like Mary who are wishing their (possible) biological half-sisters would have assisted in answering a few questions, take the DNA test and wait. In this case Mary will want to take the autosomal/Family Finder test. We suggest FamilytreeDNA thanks to their large database and Surname DNA Project in this scenario. I took the Family Finder test. Can I still join a Surname Project? Most Surname Projects welcome Family Finder test-takers, as a way to include you in the family research. However, your Family Finder test results will not be displayed on the project's Results Page, as Surname Projects use the yDNA test to trace the father line, since yDNA is passed down from father to son, just as the surname is passed down. Your Family Finder test tests your autosomal DNA--the DNA you received from all your recent ancestors, going back about 5 generations--but does not trace a particular paternal line. By joining the project, you will be able to provide your family's pedigree and will receive updates whenever there is new information posted on the project's website. The worse that could happen is that Mary may find new cousins. To read about the ideal scenario visit DNA to the Rescue, II: Identifying the Unknown Soldier. (To protect both the client and biological family: Mary’s name has been changed to protect the client, email excerpt is from email sent 29 Jan /2014 to a3Genealogy, surname is not given as we opted to use soldier’s actual unit and location). Why Is Robert Burns' Night Popular in America? 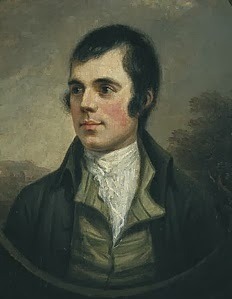 Even if you don’t know Robert Burns, the 1700 poet, you know his work. It is not clear how Robert Burns, also known as the Bard of Ayshire, and the Rabbie Burns, became so influential to the American culture. But, even in January 1864, President Abraham Lincoln was invited to a Robert Burns celebration. John Steinbeck’s 1937 novel, Of Mice and Men, was titled after Burn’s To A Mouse. 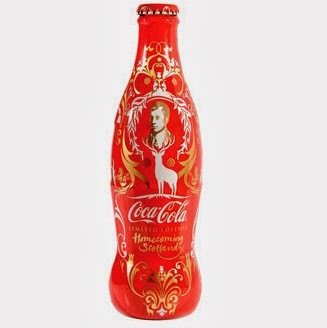 Coca Cola, 2009 Generation, Robert Burns was staring at you from the commemorative bottles! As you enjoy your haggis, neeps (turnips) and tatties (potatoes), follow President Lincoln's example and at least offer a toast to ‘ole Robert! Visit Academy of American Poets. We have had one a3Genealogy client who holds Robert Burn’s Cousin bragging rights, 2012. If you have spent any time in researching your African American ancestors’ burial site, you have probably come across a highway, road or runway running through what should have been the plot site of your ancestor. African American burial sites were not usually part of the city planning, so as city expansions took place across America, this valuable land was “commandeered” for city development projects. So where were the deceased reinterred? Historically the largest African American cemetery in the St. Louis area was the Washington Park Cemetery located in the City of Berkeley, Mo., in 1920. As accustomed, this area was unincorporated. 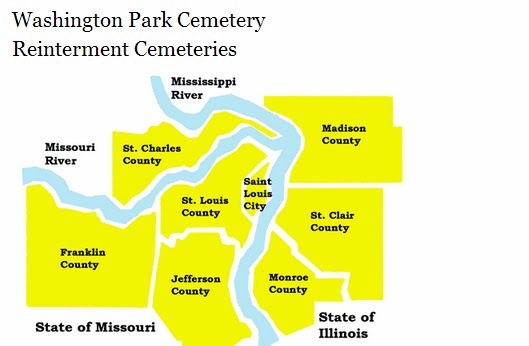 This Cemetery Project included the disinterment and reinterment of “the human remains buried in the affected area” to include 15 cemeteries in St. Louis County and 4 in St. Louis, in addition to others. Although researchers of other displaced African American cemeteries may not be so lucky, Washington Park Cemetery researchers are provided the names of the 11,976 disinterred as they were reported to the St. Louis County Recorder of Deeds and the St. Louis City Recorder of Deeds. The Index of the Washington Park Cemetery Reinterment is online. The online index provides the name of the deceased and his original gravesite location and the name of cemetery and location where reinterred. Researchers will also note the “Status of Deceased” is marked as M (for moved) and the date moved is given. If paired with the online Missouri State Archives Death Certificates (1910-1960), you may solve the mystery of end of life and burial events of your ancestors. This information was abstracted from the City of St. Louis Recorder of Deeds and Vital Records Registrar website. It's always first quarter that I'm booked for keynote speaking engagements and media work. Here's where we are to date. I hope to see you soon! "Midwest Genealogy Center will hosts two experts in the field of genealogy..."
The last command you probably heard upon military discharge was “put your DD214 (or discharge papers) in a safe place.” But things happen - multiple moves, home fires, flooded basement with all your storage. Yes, at a3Genealogy, we have heard it all! But there are times you need that one document immediately, and it’s not at your fingertip. Matter of fact, it may not even be in the same State. So how do you get an expedited copy of your DD214 or other Personnel Record? Where do you begin? I’m sure you have heard of it by now, but just in case, know there’s a new Portal in town. It’s free and fast. Veterans, you must set up your Premium Login to use the My Dashboard eBenefit tool to access some documents from your Official Military Personnel File. From here you can download a copy of your DD214. Be sure to watch the easy to follow eBenefits Site Tour YouTube video to get started. Of course you can do other tasks too (i.e. view your benefits status, access VA Payment History and apply for VA Home Loan Certificate of Eligibility (COE) and more. Veterans and authorized next of kin can also request the DD214 via eVetRecs. But keep in mind this does not guarantee a quick service, but is free. Since no system is perfect, you may find that your DD214 or needed documents have not been digitized or are not available via eBenefits. 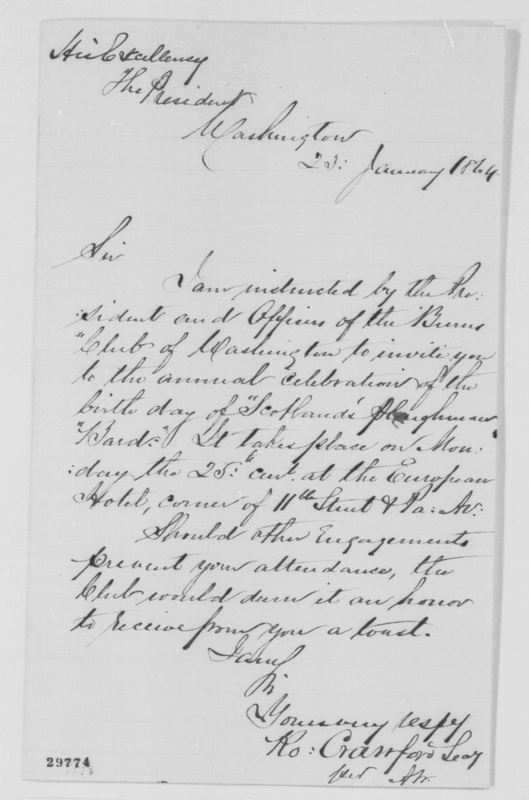 Whereas eBenefits is free, a3Genealogy is a fee-based service and we specialize in expediting VA requests, by hand carrying your military personnel requests through the process at the National Archives (NARA) Personnel Record Center in St. Louis, MO. Our St. Louis researchers are onsite daily and our Document Retrieval Service usually can provide a digital copy of your requested DD214 within 24 hours (allow for 3-4 days for Certified copies.) We can scan or email a copy of your DD214 and will send certified copies via Priority Mail (mailing costs is included). If you are asking for your entire military service record to be copied and forwarded expect 3-5 days for completion. What is the a3Genealogy Turnaround Times per Military Service Branch? Contact a3Genealogy for our Quick Process Forms. The all inclusive $100.00 fee can be made at our Client Payment Center. But remember check for the eBenefits free version first. Beware of Copy Cat Research Firms…but they would never tell you about eBenefits! 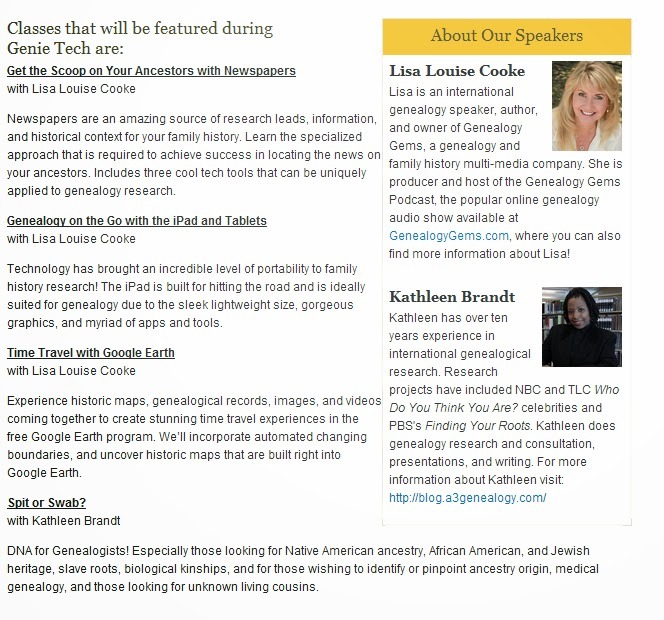 There’s no question that genetic genealogy involves Genealogical DNA testing resulting in participants confirming, denying or verifying genetic kinships between one another usig a shared database. For genealogists and family researchers FamilyTreeDNA, Ancestry.com DNA and 23andMe DNA testing companies are household names. If you haven’t been keeping up with what’s trending, you may wish to review how DNA tests can further your genealogy research. The 23andMe Autosomal test still provides wonderful data for genealogical search. It still provides family data, historical migratory paths, and more. 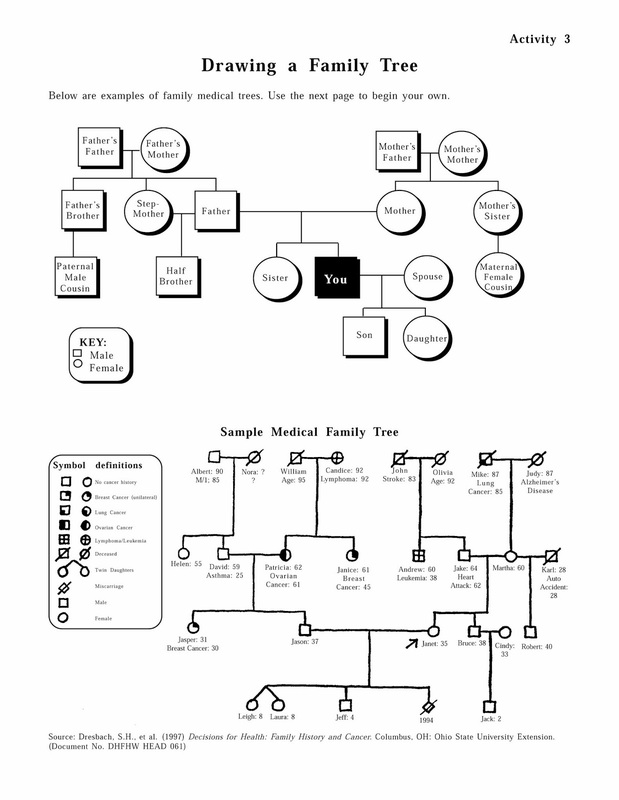 The researcher can still chart a Medical Genealogy tests with the assistance of cousins, aunts, uncles, etc., to present to a Geneticist for analysis. And, as a side note: participants should still need implement “best practices” for best health results (eat right, exercise…you know the routine). But that is another topic. Here is the summary (not direct quotes) of the five questions posed by CCTV America to Kathleen Brandt on the air. (1) Would you say the Growth of DNA sites is trendy? DNA testing is trendy, but probably here to stay. It can help solve genealogical brickwalls. In genealogy we use it to assist our research with adoption cases (finding relatives), identifying war brides or children of war, defining migratory paths of ancestors (point of origin), surname evolution and changes, and as a tool for medical genealogy with the assistance of a Geneticist. For more on charting medicalgenealogy visit Medical Genealogy: Staying Abreast of Trends. (2) What makes DNA testing attractive to participants? FamilyTreeDNA and 23andMe hold large databases. FamilyTreeDNA has over 640 thousand participants, and 23and Me has an excess of 500 thousand. Once a person has been tested on a site (FamilyTreeDNA, 23andMe), as the databases grow, additional genetic matches are found. Participants are notified of possible matches (kinships) by email, allowing for an opportunity to meet new cousins, share family histories, etc. (3) Is DNA testing more popular in the USA than in other countries and why? Due to the extensive immigration, of all nationalities, into the USA, DNA testing is often used to determine ethnic origin. Although genealogy research has long been the USA 2nd top hobby (next to golf) thanks to popular TV shows like Who Do You Think You Are? (TLC) and Finding Your Roots (PBS) demonstrating successes of DNA testing as an effective tool for solving family mysteries, the demand for these tests has increased in recent years. (4) What can the participant expect from DNA testing? What are the benefits? Each client may find new and surprising results. Unbeknownst to the participant their surname may not be a match with genetic cousins. This could be due to a Non-Paternity Event (adoption, "love child", extramarital affair). DNA tests can connect the correct families. DNA tests may also confirm slave kinships or slave/slaveholder kinships, to name a few expected (or unexpected) results. (5) How does a3Genealogy implement DNA testing with clients? At a3Genealogy we analyze DNA test results as part of our genealogical services. 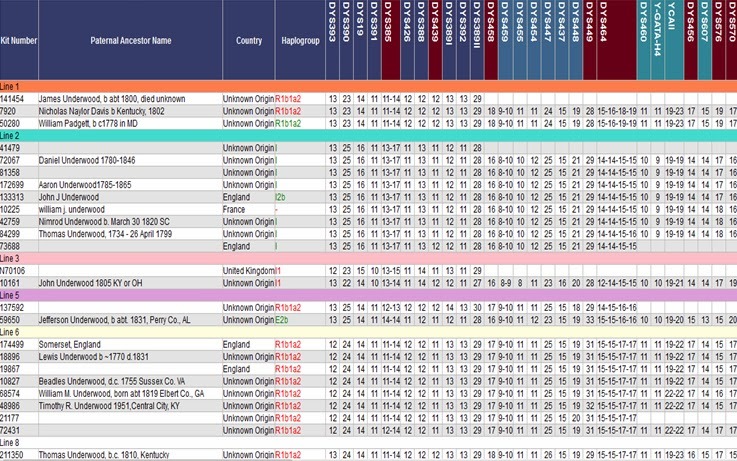 DNA complements, confirms and verifies our genealogy paper-trail. We usually do not perform a DNA tests until after an extensive research project has been completed (except perhaps in the case of adoption or unknown parentage). We often suggest DNA testing to private clients, or for heir-ship cases, where we search for heirs of an estate.